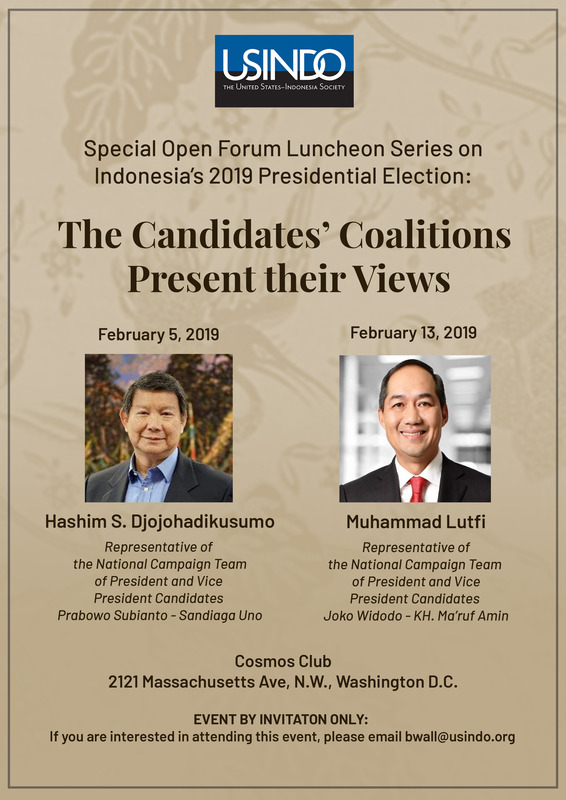 USINDO is delighted to announce we are holding our Special Indonesian Presidential Elections Open Forum Luncheon Series in Washington again this year, ahead of Indonesia’s fast-approaching April 17 Presidential Election. Information for those interested in attending is provided further below. Based on our 2014 series and USINDO’s recognized neutral position, our 2019 Special Elections Series will provide the two coalitions an equal and balanced opportunity to present their views and platform to our highly interested Washington audience. On February 5, our Elections Series speaker will be Pak Hashim Djodjohadikusumo, Co-founder of the Gerindra Party and Vice Chairman of its Supreme Leadership Council. Pak Hashim has been appointed by the Campaign Team of Presidential candidate Lt Gen (ret.) Prabowo Subianto and Vice-Presidential candidate Sandiaga Uno to present their views at our event. Pak Hashim’s bio is further below. On February 13, our speaker will be Pak Muhammad Lutfi, former Indonesian Minister of Trade, Chairman of the Investment Board (BKPM), and Ambassador to Japan. 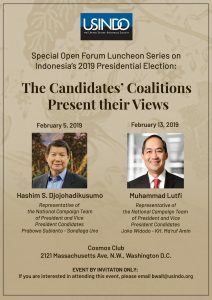 The Campaign Team of President Joko Widodo and Vice-Presidential Candidate Ma’ruf Amin has officially designated Ambassador Lutfi to present the views of their coalition at our event. Ambassador Lutfi’s bio is further below. Our Special 2019 Elections Series will be a unique opportunity for all those interested in Indonesia to become directly and authoritatively informed about the Presidential election and the key issues in play, including those relating to the United States. A seated luncheon will be followed by a speech by each coalition’s speaker, and questions and answers. Officials of the US Government, members of the public, think tanks, and media will be among those present. If you are interested in attending one or both of these events, please indicate your interest here by Thursday January 31, mentioning for which event, or both. Please note that as this is a seated luncheon with a fixed room capacity, we may not be able to provide a confirmation for everyone who wishes to attend. USINDO will send an email to those requesting seats by Friday, February 1st at 4:00 p.m. indicating whether your request for seating can be confirmed, or placing you on a waiting list. Thank you for your understanding. For questions, please contact bwall@usindo.org. Hashim S. Djojohadikusumo is Co-Founder of the Gerindra Party and Vice-Chairman of its Supreme Leadership Council. He is the owner of Pt Kertas Nusantara TBK and PT Tirtamas Majutama, and serves as President and Chairman of the Board at CITIC Canada Petroleum Limited, and as Chairman of Nations Petroleum Company Ltd.
Pak Hashim is also a philanthropist who has been supporting work on several social issues in Indonesia over the past twenty years. He is interested in the preservation and promotion of traditional Indonesian culture, education, history, environment, and wildlife protection. Through his Arsari Foundation, he has supported programs including a rehabilitation center for Sumatran tigers in West Sumatra and funding the Sumitro Djojohadikusumo Center for Emerging Economies in Southeast Asia (SDCEESEA) at the Center for Strategic and International Studies. He completed his elementary and high school in Europe and received his Bachelor’s Degree in Politics and Economics from Pomona College in Claremont, California. Pak Hashim is a son of the renowned Indonesian economist the late Dr. Sumitro Djojohadikusumo, and the brother of Lt. Gen (ret.) Prabowo Subianto, candidate for President. Pak Muhammad Lutfi joined the Indonesian government in 2005, when he was appointed Chairman of the Indonesia Investment Coordinating Board (BKPM) by former President SBY. He became Indonesia’s Ambassador to Japan in 2010. His political career advanced further when in 2014 he was appointed Indonesia’s Minister of Trade. In the same year, the Government of Indonesia awarded him the Bintang Mahaputra Adipradana, one of its highest civilian honors. Before his tenure in the government, he dedicated his time to nurturing entrepreneurship among young businessmen and chaired the Indonesian Young Entrepreneurs Association (HIPMI) in 2001. He received global recognition when the World Economic Forum named him Young Global Leader in 2008. Currently Ambassador Lutfi is Chairman of PT Medco Energi Internasional Tbk, an integrated energy company in Indonesia which comprises businesses in oil and gas exploration and production, and other energy ventures. Pak Lutfi studied economics at Purdue University in Indiana. Ambassador Lutfi has been officially designated by the President Jokowi – Ma’ruf Amin Campaign Team to represent their views at USINDO’s Elections Series event.